The Dual system (or Duel system) is a new mechanic that allows characters to co-operate with a nearby comrade. When a character–the Lead unit–enters battle with a friendly unit next to them, that character will receive three forms of benefits: a boost to their combat stats (Dual Support) and a chance of a “Support unit” performing a follow-up attack (Dual Strike) or shielding them from enemy attacks (Dual Guard). If the Lead unit is paired up, the Support unit will be their standby partner; otherwise it will be the adjacent ally whom they share the highest support level with. The stat bonus received depends on the total support rank, which is proportional to the number of allies adjacent to (or paired up with) the Lead unit and their support levels. A support level of “none” counts as a support rank of 1. C, B A and S support levels count as support ranks of 2, 3, 4 and 5 respectively. Support ranks are added for multiple characters. So fighting with two characters, one with an S support and the other with an A support, gives a total support rank of 9. If the Lead or Support unit has the Dual Support+ Skill, the support rank is boosted by 4. The maximum support rank possible is 12. Each time the Lead unit attacks (this includes each consecutive attack from a Brave-type weapon), there is a chance that the Support unit will perform a Dual Strike, attacking the enemy. 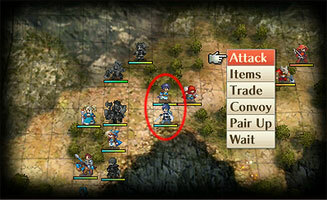 If the Support unit damages the enemy with a Dual Strike, they will gain experience and weapon experience. If the Lead or Support unit has the Dual Strike+ Skill, the rate is increased by 10. Whenever the enemy lands an attack on the Lead unit, there is a chance that the Support unit will perform a Dual Guard, which blocks all damage. The Defence stat is used when blocking physical attacks, while the Resistance stat is used when blocking magical attacks. If the Lead or Support unit has the Dual Guard+ Skill, the rate is increased by 10.